High Bay lights are specifically designed to emit natural white light that spreads over a longer and wider distance.The space is cutted down on the number of lights you would require.LED High Bay Lights are the perfect choice for illuminating any large industrial indoor space that requires intense brightness. LED High Bay Lights are the latest technology in the forms of lights. These lights will provide better visibility to your industrial space. These lights used in car showroom, warehouse, departmental store or any hotel light always plays a significant role in displaying your products and increasing its presence among an increased number of people. The LED High Bay Lights can meet all the requirements for industrial indoor space. They are ideal choice for installing in the warehouses. So we call high bay or low bay LED lighting as LED warehouse lighting sometimes. Also, these lights offer greater energy savings in terms of power as well as maintenance costs. AIS designed LED high bay lights and LED low bay lights to address the varied lighting requirements. Our LED high bay lights and LED low bay lights can be used for warehouse, as well as factory, hotel, shopping mall and office. Our LED high bay lights are ranging from 50 to 300 watts and from 5,000 to 45,000 lumens. Our LED high bay light and LED low bay light can save you up to 85% in energy usage compared to traditional stadium lighting. Most of our LED lighting has a lifespan of over 80,000 hours. This will meet the requirements to replace hard-to-reach bulbs in out-of-the-way locations. You can choose from a variety of LED high bay lights such as UFO LED high bay light,motion sensor LED high bay light,E40 LED high bay light and LED linear high bay light. It’s wise choice to convert traditional high bay lighting into more energy efficient LED warehouse lighting. And all thest LED lights contain no mercury. For more information about our LED high bay lighting, or to order any of the LED high bay lights shown below, just contact us. Our LED lighting experts are waiting to communicate with you. AIS is a leading LED high bay light manufacturer and supplier. Our lighting expert will advise you on our best LED high bay lights for sale to meet your needs. High lumens – As high as 120lm/w. This small size LED high bay Retrofit lights can replace 100W-400W HID/HPS. The lumens is as high as 120lm/w. ✔ MOTION SENSOR – This version of LED high bay light includes a built in motion sensor. This will help to save more energy and electricity cost. 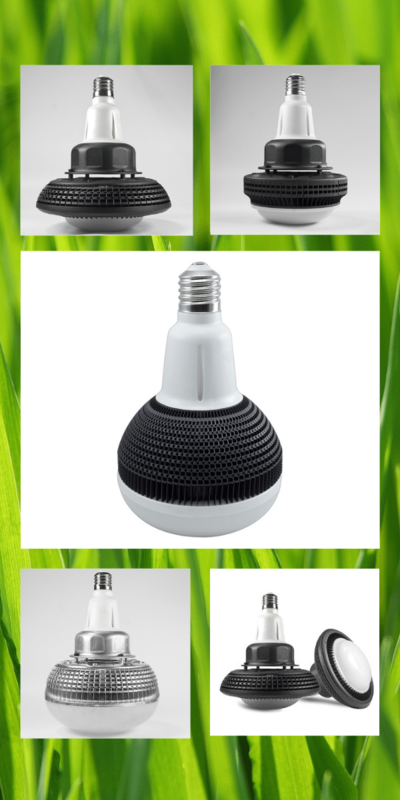 ✔ SMALLER SIZE – New ‘UFO style’ is the latest in LED technology. Smaller, longer lasting and more efficient. Only 10.6inches/ 280mm in diameter, the new design is more compact without sacrificing performance. This small size UFO LED high bay light can replace 100W-600W HID/HPS. The lumens can reach as high as 150lm/w. We have different series of LED high bay lighting for you to choose . You can choose from the following series: UFO LED high bay light,motion sensor LED high bay light,E40 LED high bay light and LED linear high bay light. Inefficient incandescents and fluorescents contain mercury. With the LED lights,now you do not have to choose them. Our LED high bay and low bay lighting is safe, environmentally friendly and contains no toxic mercury. Our LED high bay lights use only 10%-45% energy to traditional lights. As we know,consuming less energy results in fewer greenhouse gas emissions being released into our environment. That’s why LED lighting is the most eco-friendly lighting solutions. We design all our indoor and outdoor LED high bay lighting with SMD 3030 LED chips. This will make sure that our LED high bay light has high lumens which is more than 130lm/w. That is 3-8 times to traditional lamps. Using our LED warehouse lighting will help you and your clients to save more energy and cost. With our professional technical team, we design our LED high bay lights with the most attactive appearance. LED lighting is the most gorgeous lighting solutions. They illuminate people and surroundings in colour-rich light. Our LED high bay lighting are designed to blend seamlessly with any architecture. Also,the proprietary diffusing lens and reflector system delivers an optimal light distribution. We use high quality LED driver with our LED high bay and low bay lighting . Also we use innovative cooling technology with the heat sink of all our lights. This will ensure our LED lighting with 50,000 life span. Do you know what does 50,000 mean? If you ran one LED lamp for 6 hours per day, it would last for nearly 23 years. So you or your clients may never change another light within 23 years. Our LED high bay and low bay lighting comes with adjustable fixture. You can position the LED high bay lights in almost any angle for many mounting positions. Is the light output of the LED high bay light equivalent to the Metal Halide or HPS lamps? Yes. The AIS LED high bay light series will replace 600W, 400W, 320W, 250W and 175W metal halide (MH) or High pressure sodium (HPS) lamps. And they deliver the same light levels that the MH or HPS fixtures were originally designed to deliver. 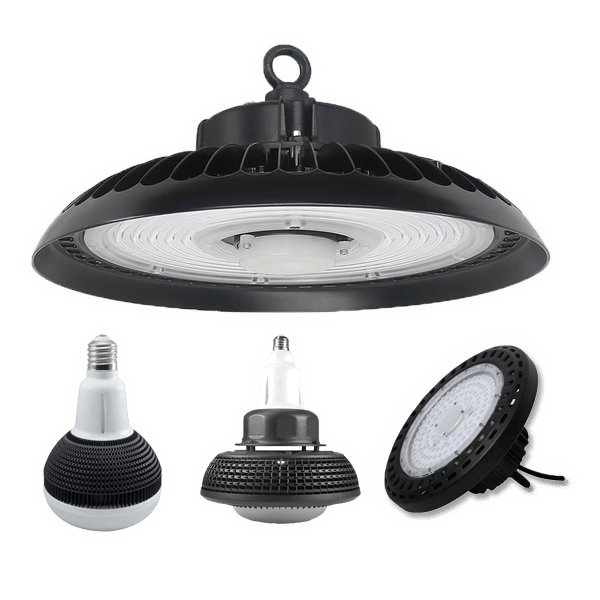 What LED chips are used in the AIS LED high bay retrofit light ? We use Philips and Sumsung LED chips in our LED high bay light. Of course, if you have any special request about the LED chips of our LED high bay light,please let us know. What is the temperature range in which I can use the AIS LED high bay light? The AIS series can be used in a temperature range of -20C to +55C. What light color do your lights produce? You can order in whatever LED color you require. The options are 3000k warm white – 4000k natural white and 6000k cool white. General 6000k cool white is most popular as this gives a crisp white light which is ideal for warehouse lighting applications. If you do not now how to choose LED color, you can find information here: Color temperature. What maintenance is required for your high bay and low bay lighting? Our high bay lightings are completely maintenance free. They are sealed units so you do not need to the change the LED’s. There is no need to get cherry pickers in to change lamps as you would have to do with older metal halide and sodium type fittings. The lightings have a 50,000 hour rated life. Will the LED high bay and low bay lighting suffer from lumen depreciation like in the case of metal halide lamps ? An added benefit of the AIS LED LED high bay lamp series is that it maintains a much more consistent light output level over its lifetime (50,000) + hours than that of a MH lamp, which suffers from rapid lumen loss. Can we use controller with your LED high bay Lighting ? Yes, you can. You can use owner controls which are remotely programmed and operated off-site. Our LED lights can be short cycled and deeply dimmed without harming the fixtures or creating objectionable flicker. If you you want to learn how microwave senso works,you can visit here:How Does Motion Sensor Work? How do I fittings attach to the roof ? As standard they come with standard hook mounts for use on a chain mounting. But you can order with a U bracket if they are intended to be fixed directly to the ceiling. Do your LED high bay lightings need time to light up? No. We know metal halide or HPS lamps need a warm up period to achieve full brightness. But LED lighting are instantly illuminated to 100% unlike metal halide and sodium lightings. In addition to this, over the life of the LED lighting you do not loose light due to age, conventional types can lose 40% of their light output of their lifespan. But LED lighting will only lose approximately 5% lumen output over it’s lifetime.